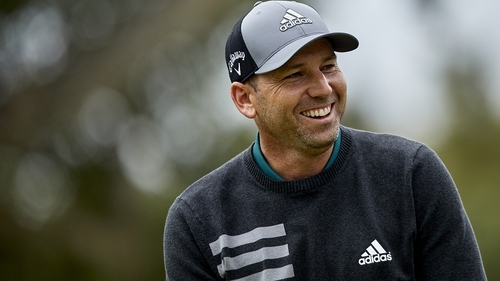 Defending champion Sergio Garcia hit three birdies in his first 11 holes to move to the top of the leaderboard at the end of the second round of the rain-affected Valderrama Masters. The Spaniard carded a seven under par round of 64 - his lowest score at Valderrama while Chesters only managed one birdie and sits second on six under par. Marc Warren joins Alvaro Quiros, Gregory Bourdy and Gonzalo Fdez-Castano in joint third, they have all completed their 18 holes and are all four under par. Shane Lowry is the best placed of the Irish. The Offaly man is three-under after following up his opening 69 with a 70. Gavin Moynihan is two-over-par, with Padraig Harrington two shots further back on four-over. The tournament, hosted by the Sergio Garcia Foundation has been affected by the weather and was reduced to 54 holes from the original 72 with the third round potentially taking place or starting on Monday. Play was suspended for a while on Saturday morning before resuming at 11:40am local time.